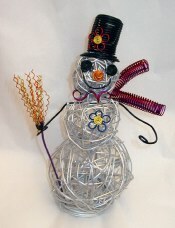 Mega Snowman, is an aluminum wire sculpture standing 24" tall. 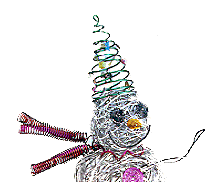 Includes decorated green Xmas tree hat, wire carrot nose, black "coal" eyes, buttons, and a long multi color scarf. 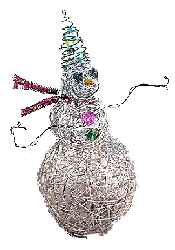 13"Frosty snowman with decorated hat like the larger mega snowman, plus multicolor scarf and 10" wire broom. Frosty Wee Snowman. About 6" tall. Hat, scarf, nose. "Frosty" finish. Stocking caps,lime, red, aqua,purple shown.